Higher air intake flow rates and smaller filters to concentrate particles. This enables better detection of small amounts of particulate matter and ensures that an adequate supply is collected for analysis from the relatively clean air in the national parks and wilderness areas where these samplers are deployed. A streamlined and rugged design to allow the equipment to be mounted in the open, even in harsh environments. In the late 1990s the samplers were redesigned to include continuous electronic data recording onto memory cards. Bar coding on every filter to ensure accuracy in the data stream. The team is currently developing controllers with the capacity to remotely transmit information about the equipment’s status via satellite or cell phone networks. 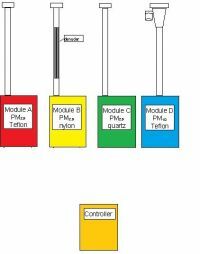 The IMPROVE sampler consists of four sampling modules housed in metal cases, each equipped with a long tube that extends about five feet into the air. 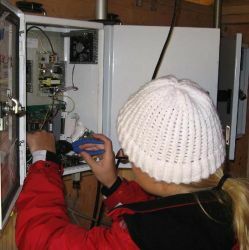 A fifth box contains the controller unit, which serves both as a data recorder and timer. Every third day it activates a pump—programmed to run continuously for 24 hours—which draws ambient air through the tubes and across specialized filters in each module. While the filters in modules A, B and C all capture particles smaller than 2.5 micrometers in diameter, the design of each filter allows a specific set of analyses to be run on the particles it collects. The filter in module D captures particles smaller than 10 micrometers in diameter. Referred to as PM2.5 and PM10, this fine and coarse particulate matter collected from the air is not only the main ingredient in regional haze, but has also been clearly linked to respiratory and cardiovascular illness. Local operators at each field site—in many cases a park ranger, firefighter or rancher—inspect the samplers and exchange filters weekly, shipping all exposed filters back to AQRC every three weeks. Each month, the program’s 170 field sites generate about 7,000 filters, which are processed in AQRC’s laboratories by two full-time staff plus about a dozen UC Davis students working part-time. The team analyzes the particles using a variety of tests, including gravimetric mass measurements to measure fine and total aerosol mass, optical absorption, and X-ray fluorescence (XRF) to determine elemental composition. Finally, filters from Module C are shipped to the Desert Research Institute in Reno where they are analyzed for carbon, and Module B’s filters are sent to North Carolina’s Research Triangle Institute for ion analysis. 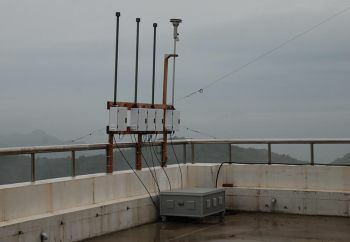 Until 2013, AQRC staff visited each of the IMPROVE aerosol samplers annually to conduct routine maintenance and calibration, make repairs and install equipment upgrades. With recent budget cuts, visits now take place every two years.